Everyone loves a good villain. An interesting and engaging antagonist is vital to a successful story, be that a physical being or an ethereal idea. From psychopaths to masterminds to literal gods, some of these characters even get more fans than their corresponding heroes. And you have to admit, there’s something weirdly satisfying about that. But creating and constructing a decent villain is difficult in and of itself. In a world with The Joker or Sauron as the possible big bad, nobody wants a Scrappy Doo. Even some big-time baddies are overestimated and overblown, to the point they’re little more than wacky inflatable tube men of evil: more a simple symbol than a tangible threat. To that end, I’ll showcase a few personal favorite kinds of antagonist, and give a couple examples. Before we continue further, I want to point you towards a similar discussion presented by some of TGE’s own. It’s a great free-form round-table about various villains and bad mama-jammas, and definitely worth a listen. Am I Evil? Yes I am! Depending on the setting, a villain can make or break the narrative a thousand ways. Think about it. Leatherface and Michael Meyers are powerful in their own rights, but you wouldn’t see them against Harry Potter. To reverse it, Sherlock Holmes wouldn’t have to work very hard to find a killer if it was a xenomorph. Sadly, he probably wouldn’t last very long either, plot armor aside. However, one example of a villain being a perfect fit for their environment is Vaas Montenegro, poster bad-boy for Far Cry 3. His manic attitude swings, savage psychopathy, and brutal actions made him a terrifying entity, arguably moreso than the game’s main villain. Vaas is shown to be intelligent, ruthless, and unstable, akin to a jungle Joker. And with how lauded the Joker is, that itself is high praise; a shining example of my favorite villain archetype. He’s a mad dog with a machine gun, a slave-trading pirate, and yet almost playful in his own murderous way. Simple-minded, extremely dangerous, and eerily mesmerizing, Vaas Montenegro is a brilliant example of the unhinged antagonist. This clip showcasing his famous speech on the definition of insanity is testament to not only him as a villain, but the actor on whom the entire character was based. Taking a quick departure from the in-your-face maniacal villain, the “background overlord” villainous archetype has surged in popularity lately. From Sauron to Voldemort to Emperor Palpatine, sometimes the big bad doesn’t need to soil their hands. And while that is a testament to their power and influence, sometimes it makes for a rather boring character. To be fair, the Old God likely didn’t need to even make an appearance in order to prove his power. The description of his undersea home and warped temples can be enough to let the reader know that this is no simple cephalopod. Yet the simple act of showing up showcases and quantifies his influence on the world and the power he holds. Ph’nglui mglw’nafh Cthulhu R’lyeh wgah’nagl fhtagn. In his house at R’lyeh, dead Cthulhu waits dreaming. Ask anyone of a certain age about Cruella De Vil and a particular image springs to mind. Balanced introductory demeanor, elegant mannerisms, and veiled depravity, all wrapped in designer clothes. Sashaying onto the scene and exuding a feeling of falseness, of the uncanny. It’s never so much as to be obvious, but it’s noticeable, gnawing at the subconscious, just out of eyesight. There’s just something beautifully wrong with certain villains that can’t be placed or overlooked. Count Dracula, Cersei Lannister, Woo-jin Lee, Walter White, Pagan Min; the list of names alone is impressive if nothing else. These are people able to blend into regular society, remarkable only for their appearances if passed on the street. These are the great villains of their respective works, hiding in crowds or remaining untouchable in positions of power. Only when control is taken from them do they allow the mask to slip. Rather than provide a singular person to showcase these elegant demented, we’ll look at a location: Rapture. This underwater hell is the host of many being fallen from their lofty positions. From Sander Cohen to Dr. J.S. Steinman to Andrew Ryan himself, grace has no standing here. The people of Rapture are, in my opinion, some of the greatest examples of villainous elegance in media. It shows that only utopia can breed such monsters. “A villain is just a victim whose story hasn’t been told”, quoting an actor whose show I refuse to watch. I do have to agree, to a point. A properly written villain can easily become the best part of a narrative, even when paired against a righteous hero. 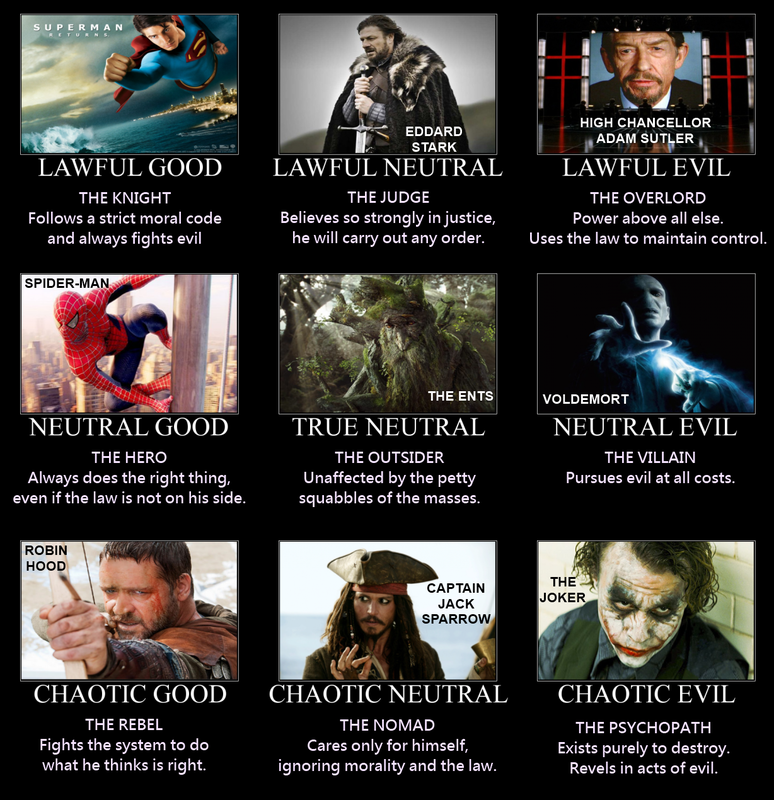 And some of the greatest villains are simply heroes in their own minds, just in the wrong alignment. But not all of them. Some are too far gone, too broken, and so far removed that they are beyond reconciliation by lawful good standards. Their intentions are good, but may be little more than pavement for their destined road. Who is your favorite villain, from any medium or story? Are they really all that bad? What draws them to you? Feel free to discuss, and I will see you again next time.